They say imitation is the greatest form of flattery – but no one said we had to keep it between humans! 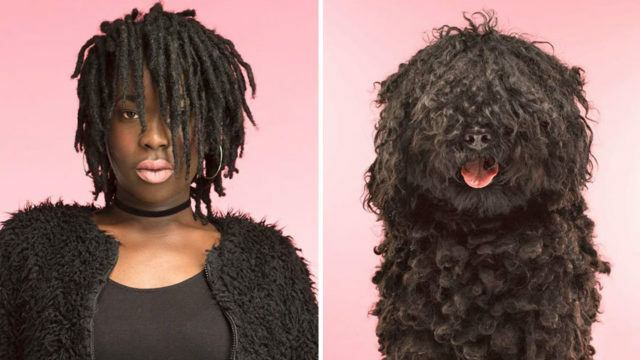 Photographer Gerrard Gethings has recently released photos from a series comparing the apparance of owners with their dogs. It doesn’t surprise us too much that these people love their pets so much that they’ve adopted a little of their style – seems like fantastic idea to us! As a talented painter and photographer, Gerrard worked with photographer Terry O’Neill, whose ease with human subjects he admired but struggled to obtain in his own work. It wasn’t until 2008, when Gerrard adopted a border collie puppy named Baxter that he says he found his muse – animals. He was able to combine his love of animals with his talent and skill with a camera, and has since become a renowned animal photographer. Gerrard’s portfolio is full of fur, feathers, and scales – he even photographs insects! But in our opinion, none of his subjects show as much personality as these dogs do! When placed side-by-side with humans, it’s plain to see why so many of us find it so easy to connect with our pets! They look just as human as the humans do! Do we love dogs because we see so much of ourselves in them? Or is do we fall in love with the things that make them different from us? Who can say? Love the photos? There’s more! You can see all 25 human/dog pairs September 10th, when the series is released as a memory game! Order yours by clicking here! You can order prints of Gerrard’s work by visiting his website. Keep up with him on Instagram. All photos used with the permission of the photographer.